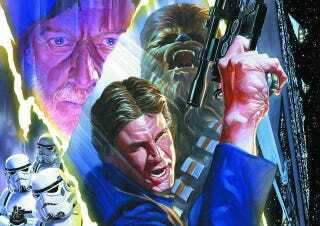 Dark Horse has just announced that they are losing the Star Wars comics license, as Disney has chosen to give it to their more-or-less in-house publisher Marvel. Damn. This announcement isn't particularly surprising, but it's still the end of an era — Dark Horse has been publishing Star Wars comics for over two decades, and 2013 saw two of their best: Brian Wood's Star Wars, set in-between A New Hope and Empire Strikes Back, and The Star Wars, based on George Lucas' first draft screenplay of the movie. The comic rights are going to Marvel in 2015, so Dark Horse will have a year to wrap up both series, so that's something, I guess. But it's still going to be a major financial blow for the company, if nothing else. For those who are new to the industry, Dark Horse revolutionized the treatment of comics based on films. After a history of movie properties being poorly handled with little regard for execution and continuity, Dark Horse took a new approach, carefully choosing licenses and approaching them with excitement and creative energy. Our goal was to create sequels and prequels to the films we loved, paying careful attention to quality and detail, essentially treating those films as though they were our own. Star Wars has been the crown jewel of this approach. We began chasing the title as far back as 1989, and with the launch of Tom Veitch and Cam Kennedy's Dark Empire, a new era in comics was born. I'm not ashamed to admit that we were Star Wars geeks, and we have been determined to spare neither effort nor expense in the pursuit of excellence. It is ironic that this announcement comes at a time when Dark Horse is experiencing its most successful year ever. For obvious reasons, we have prepared for this eventuality by finding new and exciting projects to place on our schedule for 2015 and beyond. Will they take the place of Star Wars? That's a tall order, but we will do our best to make that happen. In the meantime, 2014 may be our last year at the helm of the Star Wars comics franchise, but we plan to make it a memorable one. We know that fans of the franchise will expect no less. The Force is with us still. Marvel has out out their own press release, which says nothing except "Boy, we sure are happy to have Star Wars again!" (I'm paraphrasing), seeing as they published the earliest Star Wars comics, including the original trilogy movie tie-ins. You can read it here.